Most people aren't nearly as familar with the isabella tiger moth (Pyrrharctia isabella) as they are with its caterpillar, the banded woolly bear. In fact, there is even a widespread myth that you can tell the weather by looking at the banded woolly bear. The banded woolly bear (also called the woolly worm) has three bands. Two outer black bands and one middle reddish-brown band. 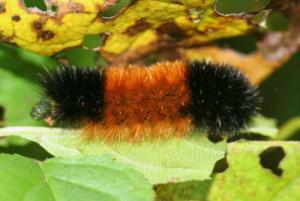 It is a common belief that you can tell how severe the winter will be by the amount of black on the woolly bear. Folklore has it that the more black the woolly bear has on it, the more severe the upcoming winter will be. When I was a child my own mother told this as if it were a fact. Of course the proportion of black versus brown this caterpillar has doesn't really predict the weather. As the caterpillar ages it becomes more brown and less black, which has to do with its age, not the weather. Isabella tiger moths belong to the family Arctiidae. This moth is common throughout most of North and Central America. Isabella moths are nocturnal and so you won't typically see them during the daytime. The isabella tiger moth caterpillar isn't very specific about its host plants. It is able to use a variety of host plants and broad-leafed trees. Like most of the tiger moth caterpillars the banded woolly worm will roll up into a ball if you attempt to pick it up or disturb it in some way. When mature, the caterpillar forms a cocoon in which it overwinters. Adult isabella tiger moths emerge in the spring. 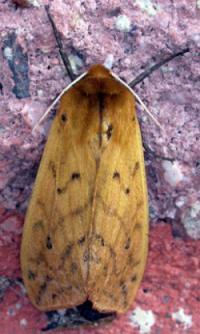 The adult isabella tiger moth has a wingspan of around 2-2.5 inches (5-6.3 cm). Copyright © 2008-2018 ButterfliesSite.com. All rights reserved. Image of isabella moth ©Patrick Coin from Wikimedia Commons published under the Creative Commons Attribution-Share Alike 2.5 license. Image of isabella moth caterpillar ©Christopher Adlam from Wikimedia Commons published under the GNU Free Documentation license.